Located in the pristine south coast of Mauritius, Villa Blanche is a sea-facing villa which provides proximity to the glistening lagoon. Nestled in a picturesque garden, this villa is ideal for group holidays, with plenty of space to spare. As a guest of this villa, you can benefit from plenty of perks, such as cleaning services to take these tedious tasks off your hands. Because it is aptly located near some of the best tourist spots on the island, this villa is also perfect for guests who would like to do some exploring. 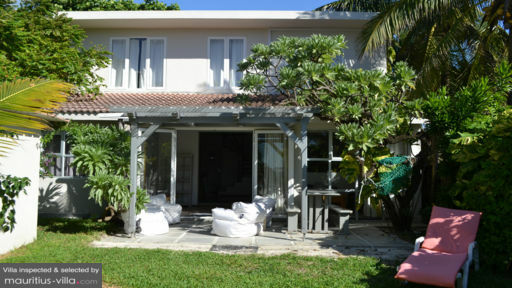 At Villa Blanche, you’ll find three bedrooms facing the ocean. In the master bedroom, you’ll find an en-suite bathroom, complete with toilet, shower and as well as his and hers sink. In this bedroom, there’s also a double bed as well as a spacious closet and safe. In the second guest bedroom, there’s also a double bed, while the last guest bedroom boasts two twin beds. These two guest rooms share a bathroom between them. 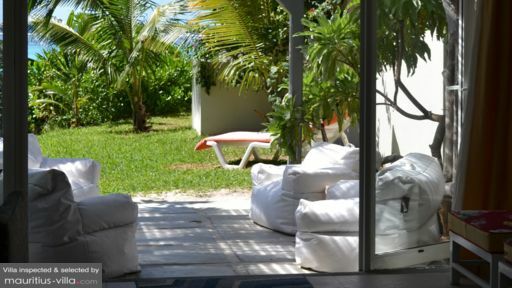 Villa Blanche is nestled in a tropical garden, which is brimming with coconut and palm trees. The garden is fringed by nearby sugarcane fields, which only serves to add to the exquisitely relaxing environment. While there is no swimming pool in the actual garden, Villa Blanche literally places the ocean on your doorstep, which enables you to go for a swim whenever you feel like it. Since this is an oceanfront villa, rest assured that you’ll be able to enjoy mesmerizing sunrises and sunsets every day. Because the beach on your doorstep is extremely secluded, it may even feel like you’ve got your very own stretch of sand to relax and maybe even sleep on, should you wish. This particular beach is also ideal for activities such as snorkeling, since the water is famously crystal clear. The villa also boasts barbecue facilities for fun nights out with your friends and families. Boasting a tropical color palette of white, yellow, red and gray, Villa Blanche boasts sweeping living areas to ensure a homely and cozy feel. In the living room, you’ll find a television with satellite English and French channels, as well as local channels. The living room overlooks the ocean, which is ideal for a relaxing afternoon indoors. The open-plan living areas also boast a dining table and chairs, along with a fully equipped kitchen that boasts a microwave, fridge, washing machine, gas stove and more. To ensure that you have a fully restful time during your holiday in Mauritius,a housekeeper will show up every day- except Sundays and public holidays- to take care of the house chores. In fact, if you don’t feel like cooking, the housekeeper will also be pleased to prepare any meal of your choice upon request, and at an extra fee. A mere few minutes from Villa Blanche is found the popular Mahebourg Waterfront, which is known for being one of the best ocean-facing shopping malls on the island. This waterfront also comes with a plethora of restaurants, snack bars and eateries, where you can feast on both international and local dishes alike. With a stay at Villa Blanche, you’ll also be a short drive from the iconic museum of Mahebourg which will give you a fascinating insight into Mauritius’ colonial past.